The Internet of things Smartphones and the mobile Internet were growth catalysts for consumer activity.An emerging new generation proximity marketing technology that connects what we are seeing with where we are seeing it, directly and in real-time. It’s an intuitive, cost efficient option for adapting to new consumer expectations delivering the right content, at the right time. 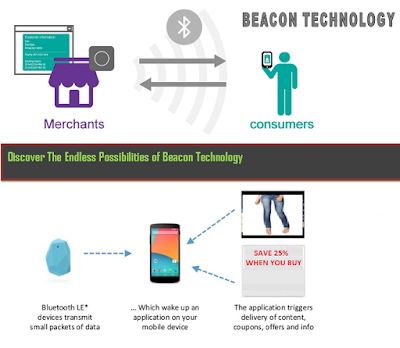 Beacon technology was made possible and practical by the invention of Bluetooth LE, a low-cost, low-energy, proximity-based network that allows Bluetooth- enabled devices to interact with other devices without draining the battery of either. Beacon technology stand location based services have used to this point – in that it uses proximity mapping rather than satellites or cell tower triangulation to identify a user’s position. This means that it can work effectively indoors, and if multiple beacons are employed at once, can pinpoint a user’s location down to centimeters. For more information on Beacon Bluetooth Advertising, please click here.